Using a flash is what separates photographers from people who got a good camera deal on Black Friday. Flash photography can be hard. There’s light theory and mathematics at play. Use a flash incorrectly and the images you’re making are often uglier than if you’d never used a flash at all. Canon’s hoping its new 470EX-AI flash unit changes that. The 470EX-AI automatically scans for the subject and the ceiling in a room, measures the distance, and then bounces the flash off of the ceiling. This should, theoretically, give your images a softer and more appealing light than if you’d just pointed the flash at your subject—as most people who don’t understand flash photography are inclined to do. In a recent briefing Canon made it very clear that 470EX-AI isn’t a flash intended for professionals. Its for people who know enough to know they need a flash, but maybe don’t know enough to properly use it. It does all the measuring using a laser located next to the flash’s bulb, which means it should work no matter how dim the room, but won’t work if you block the laser with something like a flash diffuser or your hand. This obviously isn’t the perfect super smart flash, but it is the first full size flash to try and automatically bounce the light, and that’s pretty cool. It’s also just slick enough that it should grow with a budding photographer. There’s a second, semi-auto mode that lets you choose the angle of the flash, it then maintains that angle no matter how you position the camera. So if you set it to bounce off a wall at 45-degrees and the tilt the camera or try and shoot in portrait it will automatically seek out that original angle. And should you go full-on pro and start using multiple flashes it has an optical receiver mode so it can work with other flashes you might have in the room. The Canon Speedlight 470EX-AI is expected to be available in April 2018 and retail for $400. That’s almost twice the price of the dumber Speedlight 430EX III-RT and only $130 less than the more powerful Canon Speedlight 600EX II-RT. So you’re definitely paying a premium to not bother to learn how to bounce your flash. Canon has also announced two new cameras today. The first, the EOS Rebel T7 is nearly identical to the current Rebel T6. The only difference is the megapixel count. The T7 moves from 18 MP to 24 MP. The T7 will be available in April, and as with the T6 it is expected to retail for around $550. The second camera announced is another in Canon’s long languishing mirrorless line up. The EOS M50 is fairly budget friendly. 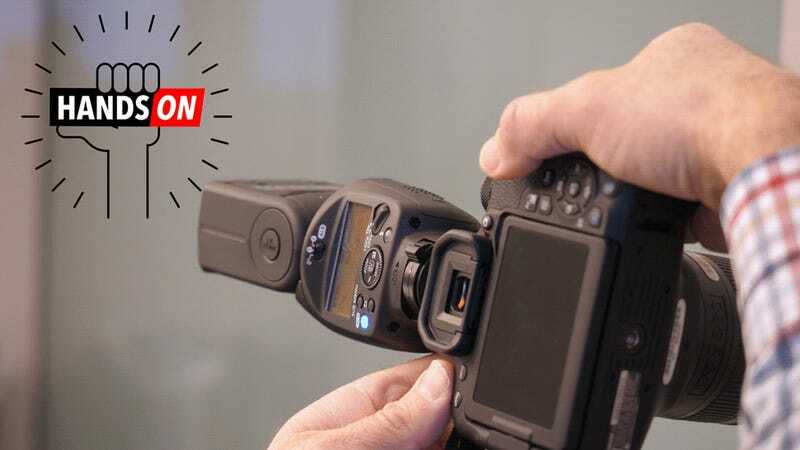 When it is available in April it will retail for just $780 for the body alone, that’s almost $500 less than Canon’s top mirrorless camera the EOS M5, and unlike the M5 the cheaper M50 can shoot 4K video. The two cameras also have nearly identical megapixel counts. the M50 as 24.1MP while the M5 has 24.2. The super light camera (it weighs just 13.7 ounces with a battery) uses a new digital processor, the Digic 8, to pull off it’s 4K videos and is the first non DSLR camera from Canon to manage 4K. That’s a bid by Canon to woo vloggers—who demand inexpensive, light cameras with a wide variety of lenses and top notch video capabilities. For the non-vloggers the M50 can also shoot 120fps video at 720p and shoot 10fps when shooting stills. And it offers a new RAW type, the CRAW. The CRAW replaces the SRAW and MRAW and is intended to be a RAW type for people hoping to save some storage space while still have some of the post-processing flexibility that that RAWs afford. Canon claims one image went from 29.5MB shot in RAW to 18.5MB shot in CRAW. While the company is not saying how it accomplishes the smaller RAW type it’s safe to assume there’s some compression happening, and while you’ll still have a better image than you might with JPEG it won’t necessarily give you the same experience as a true RAW. Like you know how you can recover an under exposed image when you edit the RAW? You probably won’t be able to recover as much with a CRAW. But don’t worry, the M50 will still shoot regular RAWs too. Unfortunately Canon wouldn’t let me shoot any CRAWs with the camera, just JPEGs (my computer wouldn’t have been able to read them anyways). So we won’t know how good, or bad the new format is until the camera is publicly available in April.